Bertrandite is more commonly referred to asTiffany Stone. It is an opalite (common opal), and often has a soft rind. 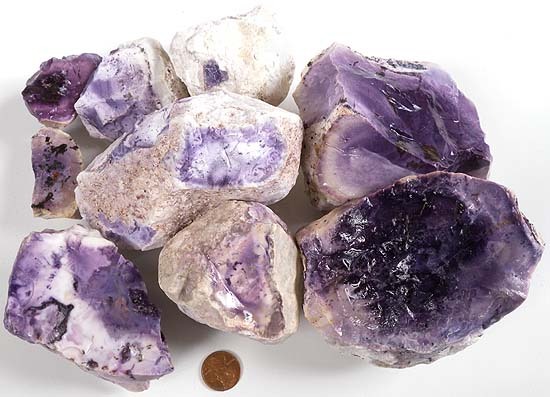 Fine quality tiffany stone has purple coloration and can even be a pure dark, translucent purple color. Tiffany Stone comes from one locality in Utah. The mine is no longer open for collecting and all of this beautiful material is now ground up for beryllium ore. The beryllium content in tiffany stone is locked up in a silicated compound, much like the beryl minerals aquamarine and emerald. Because of the compounded nature of the beryllium in these minerals, it is like any other opalite or agate and not hazardous to cut and polish . However, the dust from pure industrial beryllium, metallic alloys of beryllim or ceramic beryllium is toxic and very dangerous to breathe. 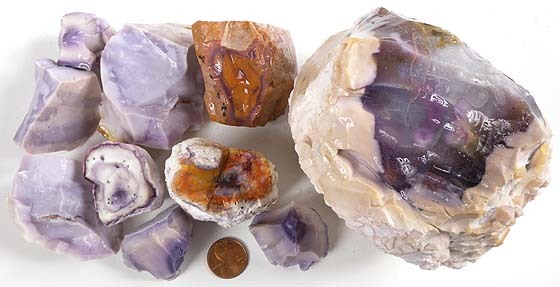 Most opalites can contain some fractures, as does tiffany stone. Some uneven hardness can be encountered in this material, but tiffany stone generally cuts easily and takes a fine polish with diamond, tin or cerium oxide. Mohs hardness is 5 to 6. 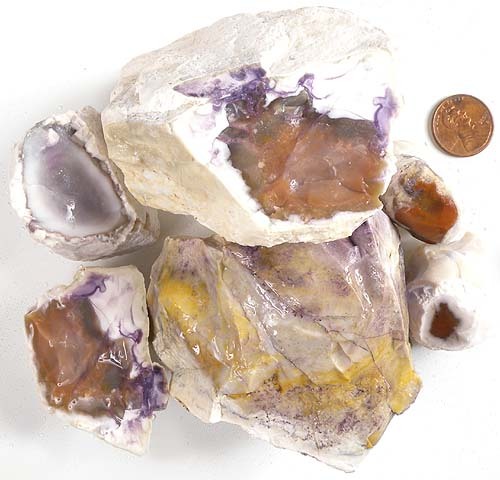 This material has light purple to yellowish and brownish coloration. Triangular shape measures approximately 2-3/4" x 1-3/4" x 1-3/4 to 1" thick. Mustard and purple with cream background. Four-piece parcel measures approximately 2-3/4" x 1-1/4" x 7/8" thick (with purples and greens), 1-5/8" x 1-1/4" x 7/8" thick at a peak (with browns, whites and purple), 1-3/4" x 1-1/4" x 1/2" thick (with mostly reddish-brown and some purple) and 1-1/8" x 1" x 7/8" thick (with white outside and brown center. This material has purple mixed with other colors, or is light to medium purple. Measures approximately 4" x 3-1/4" x 3-1/4 to 2-1/4" thick. This is the large rock on the right side of the photo above. Will cut nice slabs! Triangular shape measures approximately 6" x 5" x 3 to 1" thick. Similar to the piece on the right side of the photo. Nice mixture of purple, yellow-mustard and creams. Will cut nice slabs! Measures approximately 3" x 2-1/2" x 2 to 1" thick. This is the second rock from the left on the bottom. Measures approximately 3-1/2 x 3" x 1 to 3/16" thick. Nice figuring with similar coloring as the rock on the right. Measures approximately 2-5/8" x 2 to 1-1/4" x 1-3/8 to 1/2" thick. This is the rock on the far left side of the photo. Measures approximately 2-5/8 x 2-1/4 to 1-3/4" x 1-1/2" thick at a ridge. Coloring is similar to the rock on the top left. Measures approximately 3" x 2" x 1-5/8 to 1/2" thick. This is the second rock from the right side of the photo, on the bottom. Measures approximately 3 x 2-5/8" x 2-1/4 to 1/2" thick. Coloring is similar to the rock on the right. Measures approximately 2" x 1-3/4" x 1-1/2" thick. 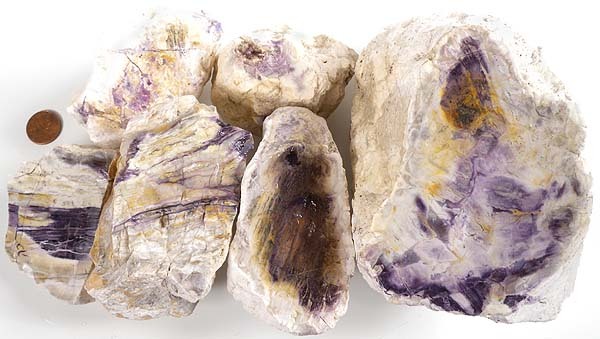 This rock has purple mixed with white and mustard-browns. Triangular shape measures approximately 4" x 3" x 2-1/2" thick at a point. Light purple and white coloring. Triangular piece measures approximately 2" x 1-1/2" x 1-1/4" thick. Color is light purple. Triangular shape measures approximately 2-1/2" x 3-1/2" x 1-1/2 to 7/8" thick. Nice light purple thoughout. Measures approximately 2-1/2" x 1-3/4" x 1-1/2 to 1" thick. Coloring of purples and whites. Triangular shape measures approximately 2-3/8" x 1-3/4" x 1-3/8 to 5/8" thick. Nice light purple thoughout. Measures approximately 1-5/8" x 1-1/4" x 1" thick. Beautiful color contrast of orange and purple. This is the stone in the middle. Triangular shape measures approximately 2" x 2" x 1-5/8 to 1" thick. Beautiful color contrast of orange and purple. This is the stone in the middle on top. Measures approximately 3-1/4" x 3-1/4" x 2-1/2 to 2-1/4" thick. Rock on right side of photo. Deep purples, with cream and brown. Will cut nice slabs! Three piece parcel. Triangular shape pieces measures approximately 1" x 1" x 5/8" thick, 1" x 1" x 7/8 to 5/8" thick, and 1-3/4" x 1 x 3/4 to 1/4" thick. Cream to deep purple coloring. Measures approximately 1-1/4" x 1" x 1" thick. Rock in the middle of the left side of photo above. Beautiful white background with light purple circle and deep purple un the middle. Purple is on the outside of the rock. Measures approximately 2" x 1-3/4 to 7/8" x 1 to 1/4" thick. Deep purple color in center that is surrounded by cream coloring. This material has fine medium to deep purples.